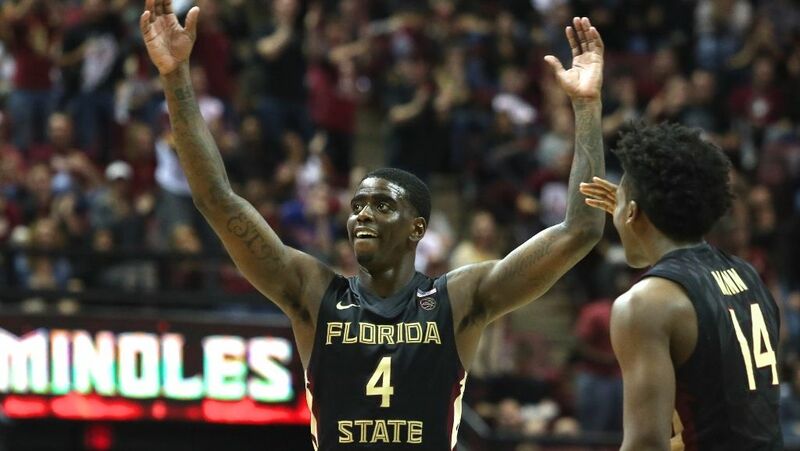 CHARLOTTESVILLE, Va. – Sophomore Dwayne Bacon scored a career-high 29 points by converting 6-of-9 3-pointers—including the game-winner—as 20th-ranked Florida State posted a 60-58 victory over 11th-ranked Virginia on Saturday afternoon. The win moves the Seminoles to 14-1 for the second time in program history and extends their current winning streak to 10 straight games. The Seminoles are the only ACC team with a perfect 2-0 Atlantic Coast Conference record. Bacon put the Seminoles in front 56-51 with a 3-pointer at the 2:07 remaining in the contest, but Virginia (11-2, 1-1 ACC) answered with a layup by Isaiah Wilkins that sliced the deficit to three just over a minute later. Jonathan Isaac converted a block and went 1-of-2 from the free throw line to give Florida State a 57-53 advantage with 25 seconds remaining. The Cavaliers used two free throws by Devon Hall and a 3-pointer off the hand of Kyle Guy to score the next five unanswered, assuming a 58-57 lead with 10 seconds remaining. Without calling a timeout, Florida State head coach Leonard Hamilton turned to the hot-handed Bacon, who came through with a clutch 3-pointer with four seconds remaining in the game as the Seminoles improved to 4-0 on the road this season. “In a situation like that, which we work on in practice a lot, if you call a timeout that gives them a shot to set their defense,” described Bacon. “The ball was on the run, the floor was spread, and we could not have had a better opportunity than what we had. I was afraid that if I called a timeout, as good as a defensive team as they have, that would not have been a very good decision. Joining Bacon in double-digit scoring was Xavier Rathan-Mayes who contributed 10 points by virtue of hitting 2-of-5 from the floor and 5-of-6 at the free throw line. Among other significant offensive contributors included Terance Mann (six points), Phil Cofer (five) and Isaac (five). Florida State was a collective 20-of-49 (40.8%) from the floor, hitting eight 3-pointers in the process, hitting 13-of-29 (46.4%) from the field in the second half. Isaac controlled glass with a game-high nine rebounds as he pulled down three offensive rebounds. Fifth-year senior Michael Ojo added six rebounds, while Cofer and Rathan-Mayes hauled in four each to give the Seminoles a 35-34 advantage in rebounding. Facing its largest halftime deficit of the season, seven points, Florida State opened the second half by putting together a 12-5 run to pull the game even at 35. Bacon kick-started the offense with a jumper just 36 seconds into the half and added two 3-pointers and a free throw to account for nine of the 12 points in the run. Virginia moved in front by four on two occasions, including a 44-40 advantage at just over the midway point of the second half on a bucket by Marial Shayok, as the two teams battled for the lead. However, Bacon rallied the Seminoles by scoring five unanswered to give Florida State its first lead since a 19-18 advantage deep in the opening frame. Solid defense by the Seminoles combined with the offensive production of Bacon and Isaac, who came through with a pair of free throws at the 4:50 mark, kept Virginia within striking distance. Bacon keyed the Florida State push down the stretch with a series of key buckets that provided a 53-51 advantage as teammate Trent Forrest added a steal to keep the Cavaliers’ offense off-balance.